Just for kicks, here's what I'd like to see in one of the next generation NEX cameras, we'll give it a seven series designation (for an intermediate or advanced amateur model) and call it the NEX-7. It'll have ±3 stop exposure compensation with a dedicated button, a slightly larger body like the NEX-3, a real hotshoe, the ability to magnify and image, and flip through all other images at the same magnification, like the A700 and up can do. Also, a mode dial with the basics like A, S, M, MR and AUTO. With the introduction of the translucent mirrors, maybe Sony can find a way to incorporate some phase detection AF into the camera too. One last item of interest, this time for the Sony e-mount lens department, how about a kit zoom that collapses, like Olympus has? I sent May, June and July homepage entries over to the homepage archives, so if you don't see something below that was there previously, it's in the archives now. The "Idle chat room" page on the nav bar has been sent to the virtual graveyard, including the four boring articles. It's been over two years since I added anything, so in this case, "idle" really meant going nowhere! Replacing the "Idle chat room" is the NEX system page. 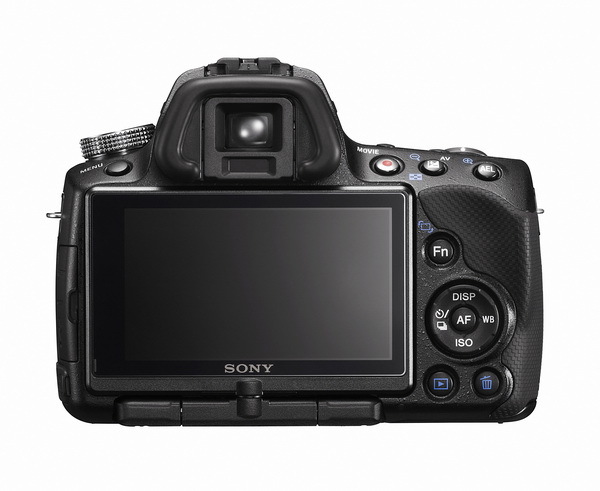 Here you will find all internal site links pertaining to the Sony NEX system, with lens reviews, comparisons, camera specs, images and accessories. It's still a work in progress, and I might change around a few things as time goes on. Another nav bar link that has been terminated forever is the "coming soon" page. If you take a look at the top of the page, just above the search bar, you'll see what I plan on reviewing as soon as I can get a copy. If "next" is written by the product, it means I have one, and am working on it. My quick review page about the NEX cameras and system is about done. I took a boat load of pictures for comparisons with other systems and lenses. Unfortunately, all those pictures were taken when this website went haywire for about three weeks and I wasn't able to actually build the review as I went along with testing like I normally do. I don't have the NEX cameras anymore, and some of the important data used for comparisons was lost. Since I'm not sure about the images and data, I'm not going to post anything more, accuracy is paramount, and making an educated guess is better left for educated people. The NEX 3 and 5 cameras perform wonderfully right out of the box. Exposures levels are dead-on, the colors are rich, but not too punchy, and the high ISO noise reduction looks very good to 3200. I used program mode for almost all my shots. Program mode allows you to set exposure compensation if needed, (my use; usually when indoors or low-light saturations), but will automatically control the aperture and shutter speed, so you don't have to worry about that. iAuto mode works fine too, but you're not able to access exposure compensation. The screen is very bright and sharp, and easy to see outdoors. People looking for a small camera that takes great pictures, and aren't interested in fussing with manual controls will love the NEX 3 and 5. Based on my use, there's no reason to mess with any manual controls except for some occasional positive exposure compensation, so feel free to leave the camera in "iAuto" or more preferably, "Program" mode. I also think the street sweeper panorama feature works very well, and does a great job of stitching the images together. A couple of problem areas are; when in manual or priority mode like "A" or "S" it's real easy to bump the control wheel by simple sliding the camera in a pouch or pocket, and that will throw off the settings, so you may find yourself shooting images using an aperture of F/32! I found that focusing in multi-area mode results in a completely blown focus, at a rate of about 10 percent, that's pretty high, so you'll need to check your shots on a regular basis, which is easy to do with the sharp screen. Additionally, the menu system is quirky to say the least, and probably could use an update immediately, but we'll more than likely have to wait for the second generation of NEX cameras to see any changes. Even though the cameras suffer from a few minor flaws, It should be clear by now that I really like the NEX cameras as a whole. I appreciate the fact that you can just point and shoot and get excellent image quality, without worrying about aperture, shutter speed and all that baloney that confuses people and makes photography a chore, when it should be fun. However, the NEX system will not replace a good DSLR, (mostly because of focusing differences and physical size for dedicated buttons; WB, ISO, eV etc. ), although some photography snobs---and reviewers, including on-line experts, expect it to. Unfortunately, those folks seem to lose site of the NEX intended purpose; small enough to stick in your pocket, with pictures as good as a DSLR! Click the image for the quick NEX review page. There was an odd color shift between the lens and camera in the original image of the one below, so I converted it to black and white, and it seems to look better. Weird. I've finally completed the NEX 16mm F/2.8 review, and it would not have been possible without B&H Photo, who graciously loaned me two brand new camera kits to play with for a month. You can thank B&H Photo, (and me) by purchasing your gear through my B&H links, that helps me to help you!! Check out the NEX deals here. The NEX 16mm F/2.8 is a pancake-type lens, which means compact size with a budget price, and not necessarily an optical masterpiece. Design considerations more than likely were small size, low cost, and a platform for a fish-eye and super-wide (12mm) converter. With that said, the 16mm turned in a good performance, but will not meet the demands of fussy photographers that examine their images at 100% all day on a computer screen. The best thing about this lens is that when mounted to either the NEX-3/5, you can put it in your loose fitting jeans front pocket, even if you have a waist size of 32 like me! Other good qualities include high center sharpness, eerily silent focusing, great for video, and low distortion, although it does have a complex pattern. My opinion on buying this lens is that it only makes sense for two reasons; if you want to put the camera in your pocket, or just want the smallest package to carry around, and you think you will use the fish-eye and super-wide (equivalent coverage of 18mm) converters. Although I didn't directly compare the images of the NEX 18-55mm and this lens, (only 2mm wider at 16mm), I didn't notice much difference in overall image quality, especially stopped down. 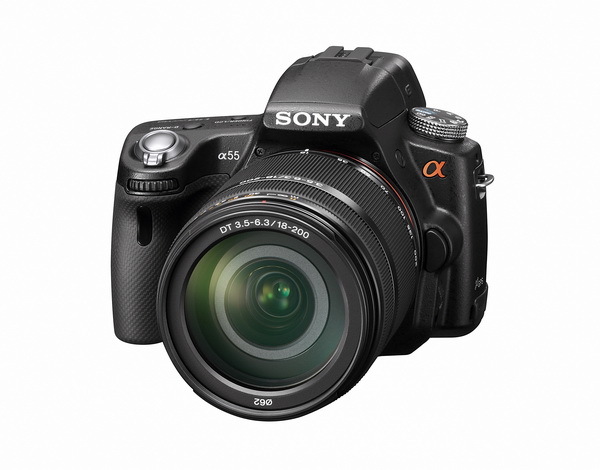 Sony unloads a few new cameras to the market, all amateur models, but they're still interesting. I'm late in getting the news out, but better late than never right! Below are images of the A33/55, (shot with a P45 digital back by unknown person). These cameras incorporate a pretty neat fixed translucent mirror, and therefore need to use an electronic viewfinder, supposedly a good one. 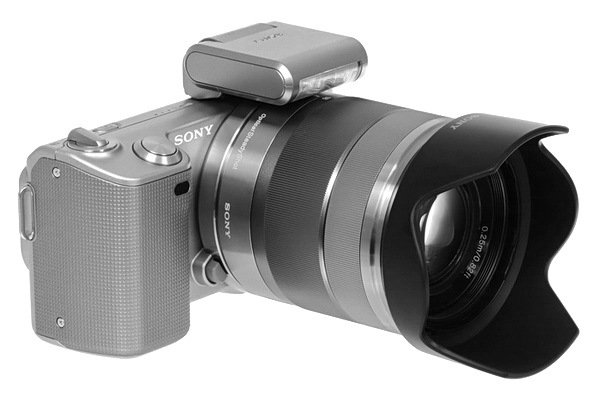 Both have HD video, but will use the standard Sony/Minolta lenses with SAM and slot-screw drive focusing system, which will lead to focusing noise in your video, unlike the NEX lenses with super quiet focusing. Thankfully, a mic port is available to help mitigate this issue. Good points are; Uses same battery as the NEX cameras. Small. More accurate focusing than NEX cameras. Has hot-shoe so you can use regular flash units. Fully articulating screen. Street sweeper panorama mode, (I actually tried this on the NEX-5 on several occasions, and found it to be useful). Questionable tidbits; not really small and pocketable as the NEX system. Sensor on A33 is identical to the NEX sensor, but A55 has new 16mp sensor, although 2mp will not provide a noticeable jump in resolution. This camera seems like something I'd like to use and do a review on, unfortunately, I probably won't. By the time I get one, all the reviews will be out, and no one will care if I come out with my own or not. I should have the NEX 16mm review ready by Thursday or Friday, so check back. Many thanks to everyone that has donated to the site thus far. I always take the time to send a gracious note to everyone that donates. Sometimes the email gets kicked back for some reason, or I never hear from a person, so I don't know if they every received my note. Be aware I'm very grateful to those that have donated to help keep the site going, so if you didn't hear from me, it isn't because I'm lazy and don't care!! I'm still adding to the NEX camera review. Many reviews of the NEX system seem to point to a slight over-exposure issue using auto mode. I've been using mostly program mode and haven't had any issues at all with over-exposure, although I haven't noticed any real problems using auto mode either. In auto mode, the camera seems to keep the shutter speeds down to a reasonable hand holdable level, and consequently, the ISO down, so the overall ease of use with excellent image quality isn't compromised. I have noticed a problem with auto-focus using the 18-55mm lens, (it may also concern the 16mm) sometimes it blows the focus completely, and not just a front/back focus miss, the whole image is badly out of focus. I'd estimate a ten percent miss rate, which is pretty high. I was using program mode with focusing set to multi-area. The work-around is to check your shots, the screen is plenty good enough to determine if the image is in proper focus. You shouldn't have to do this, but maybe it can be corrected with a firmware update. The NEX cameras use only contrast detection to focus, that's not the most accurate way, so hopefully phase detection can be integrated in the second generation models sometime in the near future to make them comparable to DSLRs. Things I'd like to see changed or added are; a dedicated button for exposure compensation. The control wheel is a little too loose and subsequently changes the exposure compensation with the slightest touch and spin. Even worse, in Aperture or shutter priority mode, you may inadvertently be shooting at F/32, or using a totally inappropriate shutter speed if you're not careful and accidentally turn the control wheel. I'd recommend buttons for those items. I'd also like to see a regular hot-shoe for a full sized flash unit. The included tiny flash is ok for very short distances, but there is no way to bounce light, and not enough power to shoot through a diffuser. I'm still working on the NEX 16mm F/2.8 review, and should have it ready sometime this week. I'm still working on the NEX 5 camera review, and the NEX 16mm F/2.8 review, which should be ready in a week or two. During that horrific period, in which I made a half dozen enemies or more at tech support, (that's in addition to the enemies I already have), I put up a completely new page for the purpose of updates, with a kurtmunger.org domain, to redirect people back to the .com site, which I couldn't update for fear of destroying the entire live site with the bad code. Both websites where pointed at each other, but it didn't work out for a number of reasons. Fortunately, tech support was able to slip a new sitebuilder platform under my .com site, and now it seems everything is ok for the time being. I'm in the process of building a real site, instead of this web based site, which is ok for small stuff, but not for what I'm doing here. The new site will take some time to get up and running, so you'll just have to suffer with this site for a while longer. The new site will probably be focused more on the new mirrorless cameras and lenses, (all brands, not just Sony) because I've just about run out of Sony stuff to review, and would like to keep going with something that interests me as well as other people. To pick up where I left off before this big mess, scroll down to the 7/22/10 entry and read about the survey results. Again, thanks to everyone that took the survey. 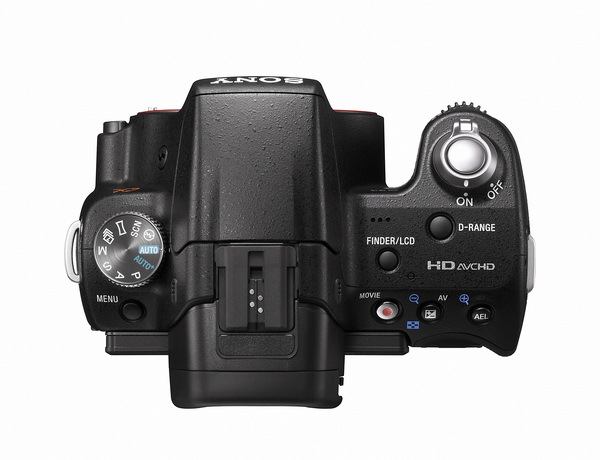 The NEX camera review page is up and running. I'll be adding to it over the next couple of weeks, so check back every few days for new information. So far I've done some comparisons between the NEX-5 and A700, like ISO and kit lens sharpness differences, and checking out the differences in general image quality. Based on my somewhat extensive use and testing, I think the NEX is superior, and yes I know there is a difference of 2mp, but the NEX sensor and processor is better in my opinion. I don't think the Sony 12.2mp sensor has much more resolution, (if any) than the old 10.2mp sensor in the A100, so I'm thinking you're really getting an additional 4mp in the new NEX system when compared to the 12.2 sensor. 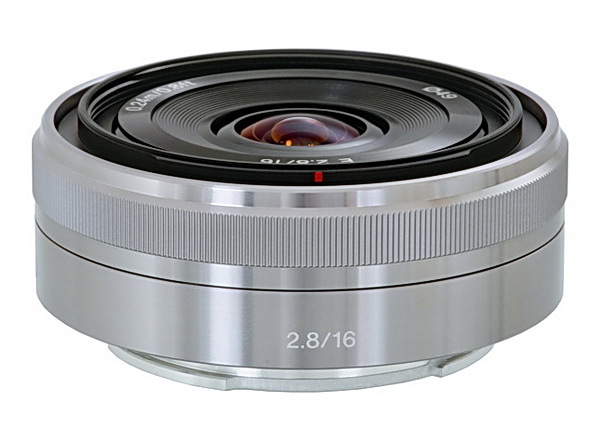 I should have the NEX 18-55mm lens review ready next week sometime, followed by the NEX 16mm pancake. Sony gives a (sort of) firm date on the release of the new e-mount lens. The 18-200mm F/3.5-6.3 image stabilized lens will be available in September for a retail price of $799. That's pricey, and much more than the current A-mount lens. I might also add, the new e-mount 18-200mm is substantially heavier and a little larger than the 18-200mm A-mount lens. When mounted on a NEX camera, you'll mostly be holding the lens, not the camera. Of course I'll be doing a full review of this lens as soon as I can get one, and others during the month of September and October. 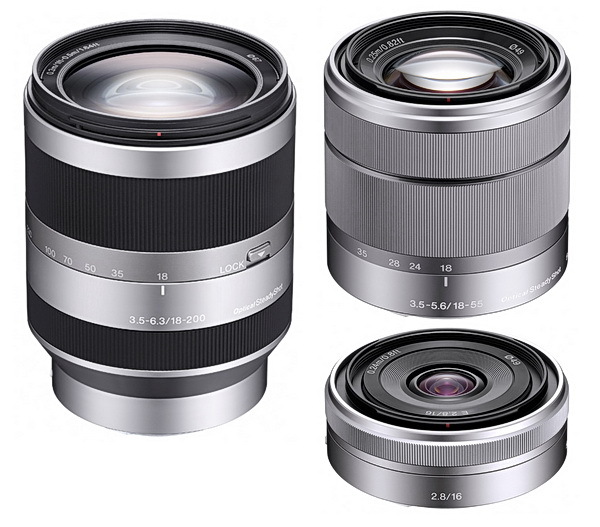 New e-mount 18-200mm F/3.5-6.3 lens (left) available in September. Over the past couple of weeks I've been working up the full reviews of both NEX lenses, along with some general observations about the camera system so far. Listed below in no particular order are some things I've noticed as I use the cameras. Both the NEX-5 and NEX-3 have the same image quality, so I'll only differentiate between them if it's appropriate. 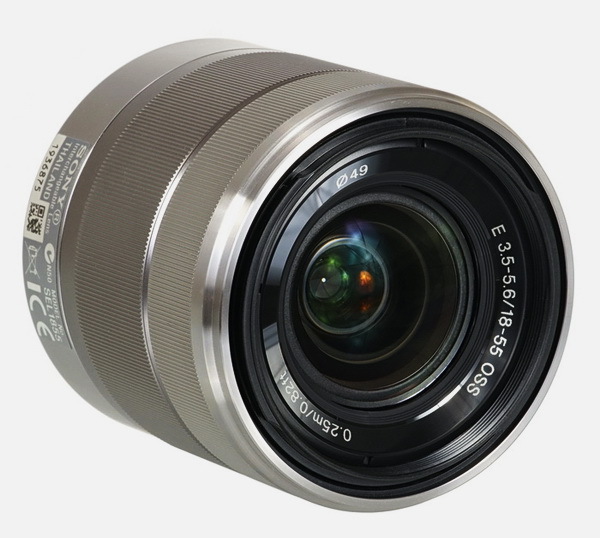 The 18-55mm comes with a hood, which can be attached in the reverse position for storage. The 16mm doesn't come with a hood, but the 18-55mm hood fits, (and doesn't cause light fall-off), although it will not reverse as it does on the 18-55mm because the 16mm is too short. Oddly, neither camera kit comes with a rear lens cap! The build quality for both lenses is very good, and the focusing system is far superior to SAM. The wireless remote that comes with some Sony cameras like the A700-900 works properly with the NEX-5 only (no support for NEX-3); which is surprising as Sony usually makes stuff like this incompatible with their other systems and models, remember the KM 5/7D and A100 non-memory batteries that won't work with the newer memory enabled cameras? Battery longevity is poor, I'm getting about 150 shots per charge without flash usage. This may improve as the battery is cycled over time, that's what has happened to my other DSLR batteries. Start-up takes several seconds, not very good in my opinion. Also, after sitting for a couple of days, I notice when I power up the camera it sometimes makes an odd noise, and if you shut it off immediately, the shutter fires, that's odd. Full HD movies in AVCHD are a pain to try and watch, because they're only viewable when you use the included software and download from the camera. When using the "street sweeper panorama" mode, the camera will only count one shutter actuation, not all that were used to stitch the photo, which will be approximately 40 shots in 9 seconds. One can imagine a person that uses this feature on a regular basis will cause premature wear on the shutter mechanism.